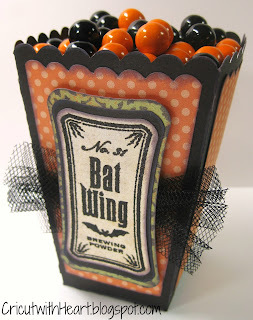 Cricut with Heart: Artiste Popcorn Box - Halloween Style! I'm going to need some fun little treats for my co-workers on Halloween, so I thought this cute little popcorn box from the Artiste cartridge would do the trick! 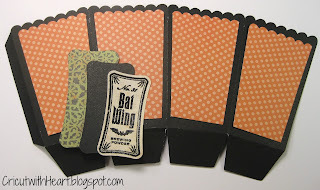 I cut the box at 4" from black cardstock, then again at 3 1/2" out of the Dotty orange paper. I cut apart the orange box to make panels on the black box. I cut the panel for the Magic Potions stamp at 2 1/2" out of Moonlight paper, and then I cut out the layers at 2 3/4" and 3". I added some Black Tulle behind the stamped panel, and then popped up the panel with 3-D Foam Tape. This popcorn box can be found on page 67 of the handbook. Now I just have to try not to eat all the candy before Halloween! Please leave a comment to let me know if you are making treat boxes for anyone this year. Love it! I really like all of your creations and appreciate your detailed information as to supplies needed, cut sizes, etc. Thanks!! These are so stinkin' cute!! Love the idea - I make things for my coworkers for each holiday too! Thanks for the detailed instructions! Love it! These are cute as can be! I'm in the process of making the coffins from Artiste and they're fun, too. My 14 year old grandsons will like them, I'm sure. Thanks for sharing! Love it! Was trying to think of a fast and pretty trea box to make and this is perfect. Thank you, I will have to make these! This is awesome! Thank you for explaining how you cut the "layers" :o) Very helpful! Oh this makes me wish I had a cricut!